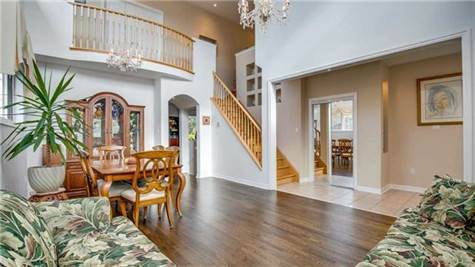 $1,169,900 Stunning 4 Bed Open Concept Home In Oakville! "9 Foot Ceilings and Hardwood Floors!" Welcome to 1331 Pepperbush Place - A Gorgeous Home with Loads of Stunning Fixtures and Finishes on a Quiet Court in West Oak Trails! This Stunning Home Features Dark Oak Hardwood Floors and 9 Foot Ceilings Through-Out! The Main Floor Welcomes You with a Stunning Open Concept Living / Dining Room with Cathedral Ceilings, an Eat-In Kitchen with Granite Counters and Walk-Out to the Very Private Back Yard, and a Spacious Family Room with Heated Floors and Gas Fireplace! 4 Spacious and Bright Bedrooms and an Open Concept Den are Situated on the Second Floor. The Master Bedroom Retreat Features a Walk-In Closet and an Ensuite Bathroom with Soaker Tub! This Home is Situated on a Premium Lot with No Houses Behind, Creating a Wonderful Sense of Privacy. The Backyard Features an Interlock Patio for Entertaining. Great Location, Walking Distance to French Immersion Elementary School.